I picked up a copy of the latest CCC road atlas, focusing on Canada but also covering the U.S. and Mexico, earlier this week at a gas station in Quebec. There's no date on the cover, but the first page shows a copyright date of 2016. I've long speculated that with Rand McNally gradually moving its release dates for 201x atlases back into spring 201x-1, someday there would be a 201x atlas released in late 201x-2. Well, it looks like that's happened for another line of atlases. -- The atlas devotes two pages to Nunavut Territory, which has no highways and very little road mileage of any kind, certainly no roads shown on the map except outside the territory. -- Coverage of Mexico and Puerto Rico (one page covering both) is about as lame as in the Rand McNally atlas. But the maps seem cleaner and more comprehensible (maybe losing some detail) in the CCC than in the Rand McNally atlas. I'm sorry…CCC? Civilian Conservation Corps? I didn't know they did road atlases (let alone, were still in existence), but that would be pretty darn awesome! EDIT: OK, I've now learned that CCC is a subsidiary, partner, and/or offshoot of MapArt. I consider that good news. CCC is the former publishing company that used to distribute Mapart Maps. The cartographer group that makes CCC maps is entirely different than the MapArt team, and the new CCC maps are of much lower quality than their former MapArt counterparts. MapArt's former cartographic group is now making maps with a new publishing house called RouteMaster. These maps maintain MapArt's former (excellent) cartographic style, however, distribution is far from complete. While I have come across a few RouteMaster maps in Costco stores here in Ontario, that's the only retail outlet that seems to have them, and they are only available at Costco while supplies last. RouteMaster has released a large format Canada/USA atlas as well, which is of pretty good quality. As a Canadian, I prefer the Canadian made maps as they tend to put more focus on both Canadian jurisdictions themselves as well as the US jurisdictions that are most frequently visited by Canadian travellers. I looked for RouteMaster atlases at various places in Quebec, and a few in Ontario (mainly Wal-Marts and gas stations), no luck finding them. I'll have to check for online availability before my next trip to Canada. I'm glad to learn all of that. MapArt was the best! Does RouteMaster have any plans to bring back the Quebec atlas? 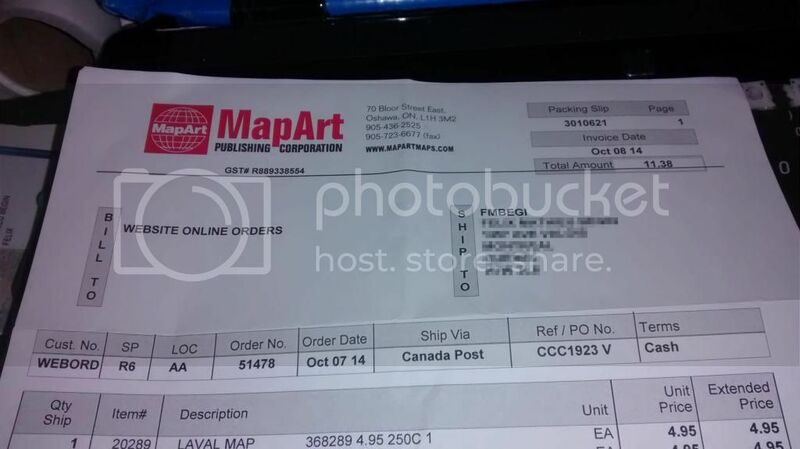 I paid a premium for a Quebec atlas from Everywhere Maps (seriously, they charge more for shipping than for the map!) because they had a picture of the old MapArt one expecting to get that. Instead I got the new JDM (CCC's French brand) crap and I'm very disappointed. If I wanted that **** I would have ordered it for much less on Amazon. Seriously, it doesn't even mark exits consistently, much less exit numbers. Plus it uses the same scale for Montreal as Blanc Sablon, which has the side effect of a very thick atlas where most people will only ever need the first third. Unfortunately, it is the only map of any kind I have of Quebec, as I have no idea how to obtain their official map. I always thought that the ESSO ---> EXXON fold-out maps were the easiest to use. They were done by General Drafting Co. They became American Map and their fold-out maps and road atlases continued to be of the same high quality. But then American Map was taken into the KAPPA Group. The 2013 KPPAMap atlas was difficult to read and I do not plan to buy any of their future editions. I am impressed by what I've seen at RouteMaster's website and now plan to order their atlas. Unfortunately, it is the only map of any kind I have of Quebec, as I have no idea how to obtain their official map. http://www.publicationsduquebec.gouv.qc.ca/fre/products/978-2-551-25243-5 appears to ship to the U.S., but you'll end up paying $16.50. Or you can click through from http://www.quebec511.info/en/carte_routiere/ to the PDFs (e.g. http://www.quebec511.info/images/fr/carte_routiere/PDF/web13_Laurentides_sud.pdf, http://www.quebec511.info/images/fr/carte_routiere/PDF/c09a_carton_Montreal_vicinity.pdf). MaîtreRoutiere does have a Quebec atlas. I have the 2013 edition. The ISBN is 9781927391150. I bout it directly from RouteMaster.ca for $19.95 CDN. I also bought their Ontario back roads atlas, which isn't as of yet, the full version that they used to sell when they were MapArt. I was deceived into buying a map from their online store two weeks ago. Their 4,95$ shipping fee was not what irritated me the most, but rather that they used MapArt paper to print invoice ― MapArt price, with Maporama quality.